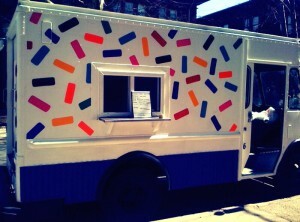 This afternoon I had the pleasure of experiencing a new Philadelphia treat, the Buttercream Cupcake Truck. Having heard talk of this roving bakery for weeks, I figured I should investigate when word came that it was in the area. They had about 8 options to choose from combining chocolate and vanilla cakes with different buttercream icings and ganache. I wanted to get something green in honor of my Irish heritage, but it turns out every option came with shamrock sprinkles in a shamrock wrapper. The vanilla cake with peanut butter icing was delicious and the accents certainly reminded me of the old country. You can learn all about the truck’s mission at the Buttercream website. You can also track the truck’s location around town by following them on Twitter at buttercreamphl.